Right now it’s summertime, and that means that it is the perfect season for riding motorcycles. If you are a motorcycle enthusiast then you how important it is to have a quality helmet. But how do you choose a helmet that will let you enjoy the freedom of riding while protecting your head? Here we have listed the 10 best rated Daytona helmets on the market right now, for your convenience. This full face helmet has two facial shield options, and it exceeds D.O.T. safety standards. The shell allows for you to feel the wind on your face, and is not constricting. The visor is extra durable compared to the visor attached to the Skull Cap. It is lacking in ventilation, making it less appealing as a full face helmet. It does not cover your face, so if you do get into a collision, you will be partially exposed. It is a pretty basic design, and it leaves a lot of your head exposed in the case of a collision. This helmet exceeds D.O.T. safety standards, and comes in three different shell sizes. There is a visor to protect you from the glare of the sun, and the aerodynamics prevent any liftoff while cruising. It is made with moisture wicking fabric on the inside, to keep you nice and cool. It comes with a ratcheting strap that not everyone enjoys, and there is no way to snap the extra strap down, so it may cause some annoyance in the wind. With no visor, this basic skull cap helmet is the smallest half shell helmet ever to meet D.O.T. safety standards. There is an easy-release adjustable nylon strap, and it comes in three sizes. You will be able to really feel the wind when you’re wearing this small, lightweight helmet. The fabric that lines it is moisture-wicking, and it exceeds D.O.T. safety standards. You’re pretty exposed if you do get into an accident. There is no visor, so the sun and wind are free to get in your face while you’re riding your bike. Probably one of the more comfortable options for Daytona Helmets. The seams are on the outside, so the straps don’t interfere with your ears, and the fabric on the inside is once again moisture-wicking. Very comfortable, with adjustable straps that avoid disturbing your ear comfort. Interior is custom formed to fit your head in the best way. Does not meet D.O.T. safety standards, and is mostly a novelty helmet. No visor and half shell design leaves you pretty exposed to the elements. With all of the same appeal of the Skull Cap mentioned in our Number 2 pick, except this time with an added visor, for extra protection against the sun! Adjustable nylon strap with sliding adjuster and three different sizes helps give you the perfect fit. Smallest ever helmet to meet D.O.T. safety standards. Has a visor which will give added protection against the sun, while still giving you all the freedom of having an extra lightweight helmet. Because the helmet is so small, even with the added protection of the visor, you’re still pretty exposed if you should ever get into an accident. 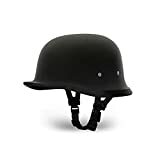 This helmet is pretty reminiscent of old German war helmets, giving it a unique look and style. However, it does not meet D.O.T. safety standards. It will look really cool while you’re cruising around downtown on your bike. The nylon straps have forward positions and will not cause any discomfort on your chin or ears. The interior is custom formed to create extra comfort for the wearer. Looking cool is about all it does. There is no visor to protect against the glare of the sun. Doesn’t meet D.O.T. safety standards. This is a modular helmet, with clear face mask, and outer anti-scratch to protect against everyday wear and tear. It is one of the safer Daytona helmet options available, encasing your whole cranium in comfort and protection. If you ever do get into a crash, you will be pretty protected. Only one finger is required to lift the chin guard, and the anti-scratch will make sure that it lasts a long while. It is also Bluetooth ready, so that you can take phone calls or listen to your favorite jams while riding. There is not a lot of freedom to feel the wind in your face with the facial shield. Similar to the Skull Cap, this is a half shell style helmet, except that the visor is not an extra piece that has been bolted on, but rather it is part of the helmet itself, part of the mold. It is still a small size, and meets D.O.T. safety standards, and it is still made with extra comfort in mind. The sleekness of the design gives the appearance a little something extra. A simple, full face helmet with a sleek and appealing design, you can’t go wrong with the Shadow. This helmet has a clear face shield that has UV protection, so you won’t get any of the glare from the sun. The UV protected face shield protects you from the sun’s harmful rays and protects your face from the pavement if you should ever get into a collision. The moisture-wicking interior is removable and washable, so it won’t have to get too funky. It exceeds D.O.T. safety standards. There is ventilation for yourchin and forehead. You may feel pretty restricted in this full-face helmet design. Another full-face helmet, but this design is a little more interesting to look at than the Shadow. It has an inner, retractable smoke shield, and an outer, clear, anti-scratch full face shield. It might be the safest helmet on this list. It has a visually appealing design. It is Bluetooth ready, so you can listen to itunes while you’re riding around. The double shield and the full face is definitely constricting. The last of the options for the Skull Cap style Daytona helmet. This one doesn’t have a visor, but an inner shield to protect your eyes from debris or the sun. It provides a little more coverage than other Skull Cap style options. The inner shield is retractable, and anti-scratch treated, so it will last a long while. Pretty much the same as other Skull Cap helmet options, it is still the smallest helmet option, even with the inner smoke shield, and leaves you relatively exposed. Motorcycling and racing are among the popular sports adopted worldwide. These are also famous among those people who love adventure and thrill. Nowadays, many teenagers also adopt motorcycling as their hobby and passion. Some people are crazier about motor racing. Still, many people fail to realize the importance of safety which is always required for protection. You may easily find many mishaps and accidents may cause deaths. These accidents took place due to the absence of a helmet or any other security accessory while motorcycling. The Daytona helmet is an essential accessory for the riders. This is considered an integral part of motor racing. These helmets protect the rider in case of any collision or crash. Various studies show that many people who get severely injured while accidents are just because of the absence of these safety guides. Daytona Helmets have the smallest DOT (Department of Trade) standard models to give you maximum protection with minimal interference. Daytona’s are constructed of the newest materials, featuring high-density carbon fibre over an injection moulded shell, filled with an energy-absorbing liner. The lightness and ease of utilisation have made many who had initially scorned wearing headgear to switch riding behaviours, and some frustrated cyclists to change from full-face models, especially in the summer months, when less protection against the elements is necessary. Partial cover helmets which meet DOT standards are almost as highly rated for protection factors in accidents as full-face models, a study recently revealed, no doubt due to use of cutting-edge technologies in the construction process. Comments from riders using DOT helmets indicate the advantages are many. Some enjoy the relief from claustrophobic full-face styles, and like to keep their rest stops short and efficient by leaving the helmet in place while eating and drinking, something not possible, before. Features like the drop-down sun visor, which recedes into the shell, make sunglasses or goggles unnecessary, are very popular, but the same models include a strap for holding them if a rider prefers that option. 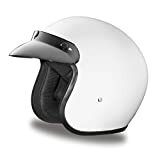 Vented to give a maximum cooling, the combination of excellent design and good use of latest technologies make Daytona Helmets a wise choice for safety and protection, as well as style. Straps are made from Tubular nylon, heat shrunk for strength, and feature D-ring closures or the new custom quick-release system. 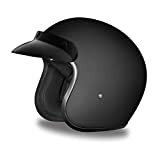 Daytona Helmets are available in classic matt black, glossy black or a very large assortment of colours and finishes. Custom bike owners will be delighted at the variety of designs, easily finding one to suit the new paintwork. Many models now have 3XL and 4Xl sizes available, for a small extra charge, well worth it to find exactly the correct fit. Accessories for Daytona Helmets in the form of visors, head wraps, and goggles can be found at their well-maintained site. The Daytona helmets are one thing that you need to make sure you have when riding your motorcycle. Here is a simple guide that can help you buy the right helmet for any of your riding activities. The first thing that you need to consider when buying your Daytona helmets is the type that you want to buy. There are three types of helmets that you can purchase. The types include the half, three quarter, and full-face helmets. Each one is substantially different from the others. The half helmet only covers the top half of your head for the most part. This type of helmet provides a great deal of comfort and ventilation but offers the least amount of protection. The three-quarter helmet provides more protection than the smaller half helmet, but also provides a great deal of freedom in that your face is not completely covered. This allows for more ventilation than the full face version. The full face helmet provides the most protection for the rider because it completely covers the rider’s head. 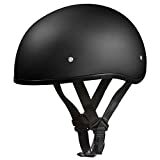 The downfall to this is the fact that there is less ventilation, which is why this type of helmet usually comes with vents in the front and the rear. The next thing that you need to consider when purchasing a new Daytona helmet is the size. For it to fit properly, you have to purchase the right size for your head. You can easily figure out your size by measuring your head with a soft measuring tape. Consider using a measuring tape and gauge the circumference of your head, or the complete way around your head, just in the upper point above your eyebrows. Record this measurement and use it when viewing sizing charts for the helmet that you are thinking about buying. This will help you get the right size when ordering. 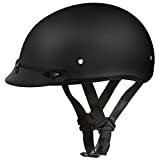 If you have a particular brand of helmet that you prefer, then you can narrow your search down to include only the helmets that are that particular brand. Some brands are more expensive than others, so you’ll have to decide if the brand you prefer has helmets available that are within your price range. In this case, Daytona helmets solve the struggle. Next, decide what color you want your helmet to be or choose a particular design that you think will look good on your motorcycle. Many riders try to match up the colors and style of their helmet with the color scheme of their motorcycle. When you do the same, you’ll have a great looking Daytona helmet that helps complete your entire biker wardrobe. In conclusion, remember helmets do not promise and ensure 100% safety against any head wound. They are to reduce the severity of the wound. This will further help to decrease the risk of more damage. You can find helmets in different types. Some of these are more beneficial and protective than others. Moreover, few helmets protect the head as well as the face. One of the most popular and the best type of helmets is the Daytona Helmets. Go and select Daytona helmet and you will never regret.